You hear the phrase “cash is king” talked about a lot in these credit-crunched times. But what’s really different about today’s low rate environment? Businesses survive on cash flow, it’s a bit like running a car. You can have the best car money can buy but if it runs out of gas, it will grind to a halt regardless of how well you’ve looked after everything else. The same is true with our personal finances. We need cash to run our lives and all the assets in the world won’t save us in the moments when we really need liquidity. 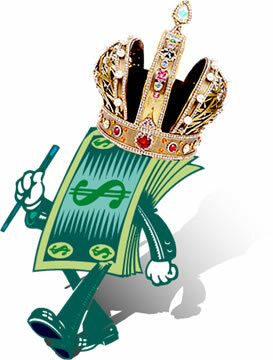 So yes, cash is always king. The only thing different about today’s credit markets is that credit is harder to come by as the banks impose more stringent lending conditions; a hangover of the recklessness from the past decade. But this shouldn’t present a problem for the far-sighted person who always keeps enough fuel in the tank to make the trip. There are many steps you can take to make sure that you or your business doesn’t run short of cash. This is obviously easier said than done for businesses that are profitable. And for people who have managed to build up a solid asset base, capital can be leveraged more readily. The situation is not necessarily a problem, you just need to plan ahead. Most small businesses flounder before reaching profitability but they all need funding along the way. And if you’re running a small business, you need cash to be able to run your life while you build up the business. This is the life-blood you will need that should enable you to survive until profitability is achieved. And once you are profitable, there may still be ups and downs in cash-flow that threaten the very survival of your company. Finance providers like Debt Free Direct specialise in helping you iron out the peaks and troughs in your business and personal cash-flow. Just be sure to always borrow carefully and use debt facilities wisely. Overall, the best advice is to seek guidance from experts who know that cash is always king and who have many years’ experience in planning ahead for positive cash-flow. No problem, thanks for stopping by Kevin. Thanks for this post Harry. While it’s not quite right for my start-up (which is based in Brazil, which brings a whole new set of finance problems, that i’ll save for another day), it certainly got my mind working on medium term planning. Thanks for stopping by Max, glad I could help.